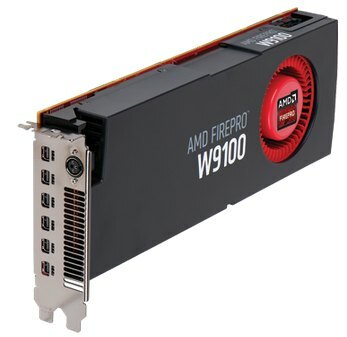 AMD has announced a graphics card for 4K workstations: the FirePro W9100. This supercomputing piece of hardware comes with non less than 16GB of GDDR5 video memory and six mini DisplayPort 1.2 allowing the card to drive up to six 4K monitors. The FirePro W9100 is based on the Hawaii GPU with 2816 stream processors (or 44 OpenCL compute units) and can crunch floating point numbers at the speed of 5.24 TFLOPS (and 2.62 TFLOPS for double precision: FP64 = 1/2 FP32). If you need some references, visit this page: GPU FP32/FP64 GFLOPS Table. The 16GB of GDDR5 memory can be used via a 512-bit memory interface. The TDP is 275W. In the API side, the FirePro W9100 supports OpenGL 4.3 / 4.4 and OpenCL 2.0. 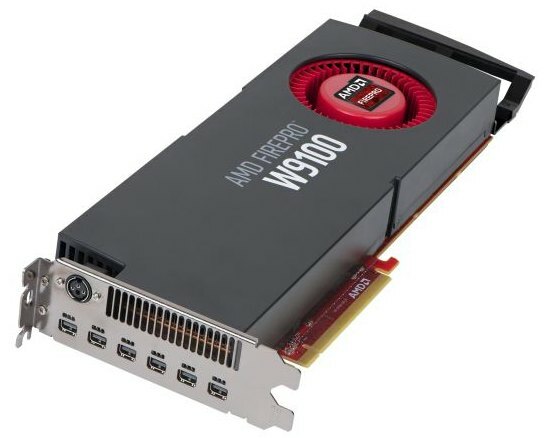 Sapphire will distribute the FirePro W9100 and we should see this card on some HP workstations like the Z820 / Z620. The launch price is unknown but you will have to spend some thousand of dollars ($4000?) to get one sample. More information on the official homepage. I have one in my PC. Thanks YulFi for the screenshot. I’ve had the card in my desktop before passing it on to YulFi, it was making my system reboot after a few minutes probably because of the card overheating. So I can’t say much on the perfs.. But YulFi seems to be more lucky than I’ve been. 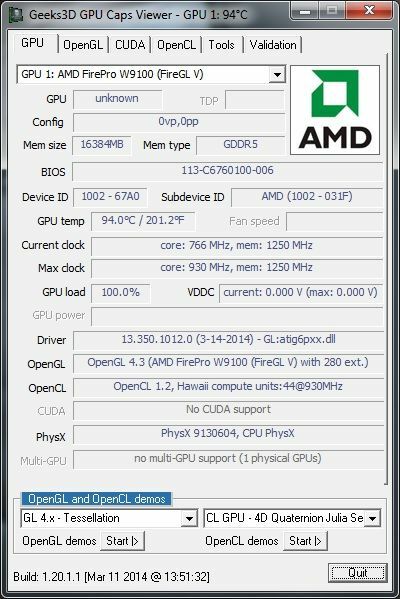 J’ai des soucis avec GpuTest 0.7.0. Je peux lancer la GUI mais tous les tests de la liste plantent au lancement(en ligne de commande aussi). Aucun soucis avec la 0.6.0, FurMark, TessMark et les démos de GpuCaps. La démo GeeXLab FP64 Julia Explorer fonctionne aussi. Hi JulFi, can contact me on muzeumhb@gmail.com for this sort of test ? wilguide you, im interested in the GPU test…..
@YulFi: c’est peut etre le plugin de monitoring de GpuTest. Renomme le reperoire plugins/ en toto/ par exemple et lance de nouveau GpuTest.